Botulism is an illness that occurs when your child ingests food contaminated by bacteria which multiply in the stomach and produce toxins. Usually uncooked food is contaminated with bacteria. • Food borne botulism: This type of botulism is caused by eating food contaminated with a botulism toxin. Food borne botulism can affect a great number of people who eat contaminated food. 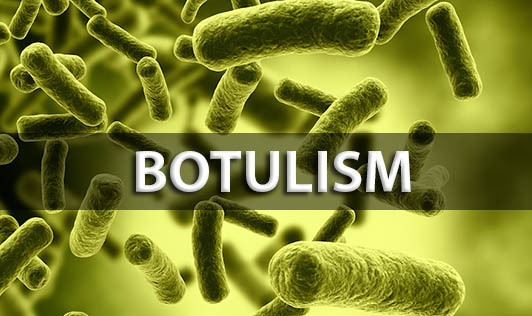 • Wound botulism: This type of botulism is caused by a botulism toxin that is produced from a wound that was contaminated with Clostridium botulinum. • Infant botulism: This type of botulism occurs when infants consume spores of Clostridium botulinum present in dust and dirt, which then release toxins in the intestines. The toxin can cause paralysis of the trunk, arms, legs and respiratory system. In these food-borne infections, symptoms start soon after the contaminated food is eaten-typically within 12 to 48 hours. • Test for botulism toxin poisons in the patient's serum or stool. Treatment will be decided by your physician depending on your child's age, medical history, and extent of the condition, your child's tolerance for specific medications, procedures, or therapies. • Be careful while you offer honey to your kid. Make sure it's not wild honey as the instances of the presence of clostridium spores are more. • Store safety is of utmost importance. Check the container of canned food for a bulge. • Avoid exposure of potentially contaminated soil or dust. • Make sure you wash your hands before you handle your child's food.